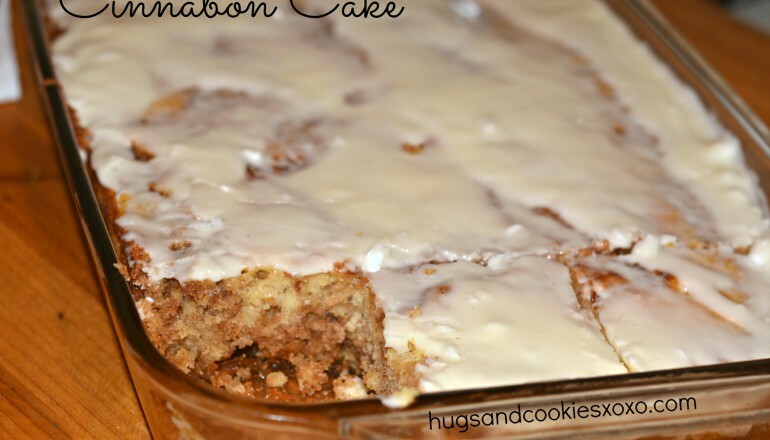 Fall In Love With This Cinnabon Cake! This cnnabon cake is actually super easy to make. If you really like cinnabons then this is something you should try. It really does taste wonderful with coffee. I like to eat it in the afternoon for a snack with a cup of coffee to keep me going in the afternoon. So. you don’t have to only make it for breakfast. Make it for any time. Make it to take to a potluck. Everyone will thank you for that! I have yet to meet one person that does not like this cake! And I’m sure that you will be asked for the recipe! This cake is fantastic no matter what time of day you eat it! Preheat oven to 350 degrees. Spray a 9×13 glass baking pan with cooking spray or coconut oil spray. Set aside. In a mixer, add the flour, salt, sugar, baking powder, milk, eggs, and vanilla. Once combined well, slowly stir in the melted butter. Pour into pan. For the topping, mix the butter, brown sugar, flour and cinnamon together until well combined. Drizzle evenly over the batter and use a knife to marble/swirl through the cake. Frosting: Beat the first 3 ingredients until creamy. Add a drop of milk at a time until still thick, yet spreadable. Quick Tip: Serve with piping hot tea or coffee. Thanks again to Hugs And Kisses XOXO for this amazing recipe. How Cute Are These Coconut Cream Pie Cookie Cups? Guess What Chicken Dinner I’m Having Tonight?